Experts said Sunday that further efforts are needed in negotiations at the WTO on expansion of the Information Technology Agreement (ITA), after talks reached a stalemate on Friday amid a reported deadlock on the issue between China and South Korea. The talks are aimed at expanding the ITA, which has not been updated for 17 years, by removing tariffs on about 200 product categories. Such a deal could be worth $1 trillion for global trade, Reuters reported on Friday. After ITA members failed to reach an agreement on the expansion on Friday, which had been set as a deadline for the negotiations, different sides expressed their opinions. WTO Director-General Roberto Azevêdo said that "the participants have significantly reduced the gaps on expanding the coverage of the ITA in recent days, but unfortunately it has not been possible to finalize the negotiations by Friday," according to a press release posted on the WTO's website Friday. Azevêdo urged members to remain actively and constructively engaged to try to bridge the gaps in the negotiations, read the press release. Representatives from the US and the EU also expressed regrets over the stalled agreement. The agreement would cut tariffs on products such as next-generation semiconductors, magnetic resonance imaging scanners and GPS devices. Currently, duties levied by China on the three categories are as high as 25 percent, 8 percent and 8 percent, respectively, according to media reports. China's Ministry of Commerce did not reply to the Global Times' request for comment on Sunday. Members will reconvene next year to try and conclude the negotiations. The breakdown in the talks was caused by a deadlock between China and South Korea over liquid crystal display (LCD) screens, according to the Reuters report, citing participants in the negotiations. When the US announced it had concluded bilateral negotiations with China on the ITA expansion on November 11 during the 2014 Asia-Pacific Economic Cooperation meetings, it was widely believed that an agreement would be reached by the ITA's member economies at the talks, which were held in Geneva Friday. Experts said patience and more efforts would be needed to push the negotiations toward completion. Bai Ming, a research fellow with the Chinese Academy of International Trade and Economic Cooperation, told the Global Times that the failure to reach an agreement was not surprising. "A WTO agreement is only valid when all the participants reach a consensus. That is how the game is played at the WTO. Because of this principle, the agreement could be stalled at every twist and turn of events before it comes into effect," Bai said on Sunday. Bai noted the example of India, which caused a four-month standoff in July this year by vetoing the adoption of a reform package by the WTO to streamline customs processes. The package had been agreed upon at a WTO meeting in Bali in December 2013. It was finally passed on November 27 this year, after a compromise was reached between India and the US. "China respects South Korea's concerns, but China has every right not to sign any agreement until it believes the terms on the table are in its best interests," Bai said. "And this works vice versa." "China has a huge market for LCD screens and several leading domestic companies such as TCL Corp and BOE Technology Group Co. 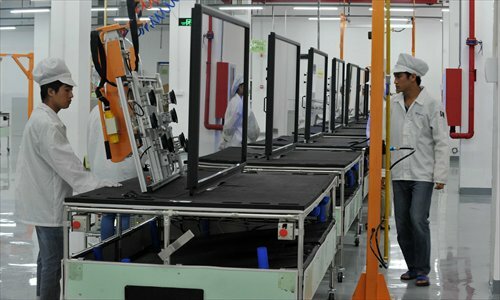 However, China's overall ability in LCD screen manufacturing, product quality, and level of sophistication still lags behind that of South Korea, causing concerns [about the possible impact on China's domestic LCD sector from scrapping duties]," Tu Xinquan, deputy director of the China Institute for WTO Studies, told the Global Times Sunday. But there is still a possibility that agreement can be reached through the final negotiation process over the free trade agreement between China and South Korea, Tu noted. China currently imposes a 5 percent import duty on LCD products. The country imported LCD panel displays worth $39.98 billion during the first 11 months of 2014, down 11.7 percent from the same period of 2013, according to the latest data from the General Administration of Customs. A lot of these LCD imports came from South Korea as well as Taiwan, said Tu. The ITA is a multilateral agreement that came into effect in 1997 under the framework of the WTO. It guarantees zero tariffs and duty free trade on hundreds of products in the IT sector, such as computers and semiconductors. China joined the ITA in 2003 as its 58th member. Currently, ITA participants represent about 97 percent of world trade in IT products.